Life is unpredictable. You never know what's going to happen, no matter how perfectly laid your plans are. You can take the safe route. Excel throughout high school. Study something that you know you can get good grades in at college. Maintain that G.P.A. Take an internship with a semi-local business until your propel yourself into a career with job security. But who knows what could happen even if you "did everything right". Someone might invent an IQ-enhancing helmet for their dog, causing a canine uprising that will take over the world. Dogs don't care that you walked the straight and narrow. You'll have live under their reign even if you got your MFA. Or you could head off the trail society set up for you and become a mad scientist grandpa who bends the rules of science and nature like he's tying a bow. Try out your alternate scientist persona with this delightful Rick Sanchez costume! Maybe you'll be inspired to take a strangely twisted adventure. It's pretty tricky to copy Rick's crazed expressions unless you have this molded mask. The ensemble includes Rick's blue and white uniform with a white lab coat for morally questionable experiments. The mask has wild, wide eyes with sheer panels to let you see freely. 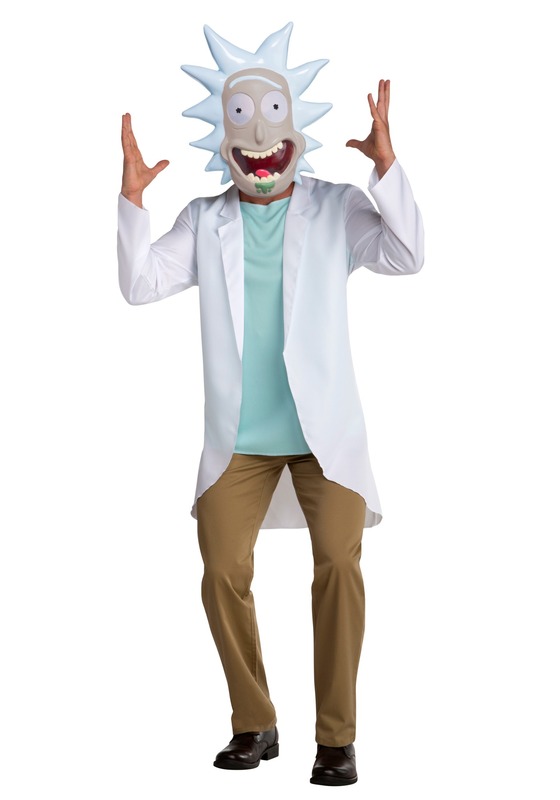 You'll even have that standard dot of drool under the mouth to make your Rick costume complete. It can be hard to be a groundbreaking scientist all on your own. Let Rick know he's not along in the multi-verse with this costume. We're sure he'd appreciate it. The best part of dressing up as Rick, even if Morty is tagging along? The more Rick and Mortys at a Halloween party the better. After all, a multiverse reunion is always a good time. Maybe you and the other Ricks can have a rant-off. That's a challenge we can get behind!